New York City was slammed by the blizzard. Telegraph lines collapsed due to the weight of ice. Communication was knocked out internally, as well as the long distance lines from from Boston to Philadelphia. Food and fuel was scarce. Before refrigeration, fresh food was brought into the city every day. Transportation of needed food supplies was impacted for several days after the storm. People wandered the streets searching for shops that may still have coal so they could heat their homes. About 35 inches of snow fell on New York City, with seven foot high drifts commonplace. An article in the March 13, 1888 Boston Globe describes the onset of the storm: "The line followed by the storm is quite angular. It started near Salt Lake, and travelled a straight line northeasterly to Detroit, when it changed, and, going south, followed a curve which took it just south of Boston, giving southeast quadrant to New York, were the gale has been the heaviest. After reaching the coast it will follow the usual course; following the Gulf stream, and sweep over New-foundland toward Europe. In this city the storm presented a remarkably varied selection of weather. At 7 a.m. it struck Boston accompanied by a blinding snowfall and a high wind, and at 2 p.m. reaching nearly 50 miles an hour. At that hour the rapidly falling barometer marked 29.88°, and the tumbling continued until midnight, when it reached 29.06°, a fall of nearly an inch in 18 hours. The temperature remained at 35° until 10:30. At 11 o'clock the wind, which had been northeast all day, swerved around to the north, and the temperature fell 3° within an hour. That marked the arrival of the cold wave. By this morning the mercury will fall much lower. Shortly after midnight the storm centre passed over Boston and the worst was over. Tuesday will be cold and clearing, with heavy northerly winds. Tonight the thermometer will fall quite low, going down fully as low as 10 above and possibly touching the zero point at exposed places." 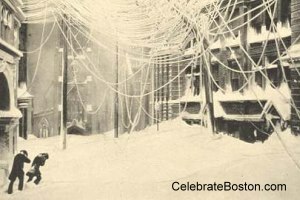 The August 1888 issue of New England Magazine published a summary of the storm: "The blizzard of 12th and 13th of March last is something to be remembered as long as [one] lives by everyone who shared in its unparalleled experiences. The only remnant of consolatory reflection it left behind was that it occurred in the middle of March, instead of middle of January. With the style of weather that made fully three-fourths of the latter month so unpleasantly memorable, there would have been no hopes of clearing up the country for inter-communication until after the bulk of people had died of cold or starvation. Boston itself was not a severe sufferer by this terrible aerial visitor. It was the country around—north, east, and west—whose experiences filled all minds with the astonishment, and almost appalled one with apprehensions of the willfulness of the elements. New York's case, however, was wholly exceptional and anomalous. It was as much cut off from the continent as if had for the time been towed out into the middle of the Atlantic. Nothing but time, aided by an elevating temperature, was equal to the serious task of effecting its release. The blizzard covered, in its whirl of wind and rain and snow, the entire territory of the eastern United States, and waltzed off into the stormy Atlantic, to hide itself, after the mischief it had done, in the cave of Aeolus [Keeper of the Winds]. The storms since the warm season commenced, also, have been somewhat uncommon in the extent of the electrical disturbance." 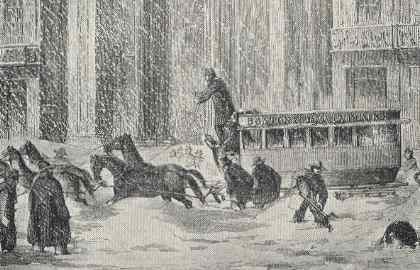 The largest cities on the eastern seaboard learned from the Blizzard of 1888. Telegraph lines were placed underground, subways were constructed to replace many surface street car lines, and weather balloons were employed to aid in weather forecasting.